After finally getting my “PC Points” all figured out some weeks (and maybe even months) of trying to get that done when Loblaws and Shopper’s Drug Mart merged their awards program, I’ve returned to Zehrs to do most of my shopping. The other day, the Zehrs store in Orangeville had some amazing specials on some of their “Platinum” Top Sirloin steaks. I love it when they put meat on 50% off with a sticker that says, “Eat tonight.” Many people think that refrigerated meat has a “hard” expiry date, but this is not really true – meat can stay good in the fridge for quite some days after the official expiry date; as well, you can always throw this marked-down in price meat into the freezer as well. Typically, top sirloin steaks are far too expensive for my budget, but when they are marked down 50%, I’ll likely grab what I can. That is exactly what I did, and last night, we put them on the barbecue and enjoyed most tender and flavorful steaks along with sauteed asparagus mixed with egg, onion and garlic on the side. Oh so tasty! 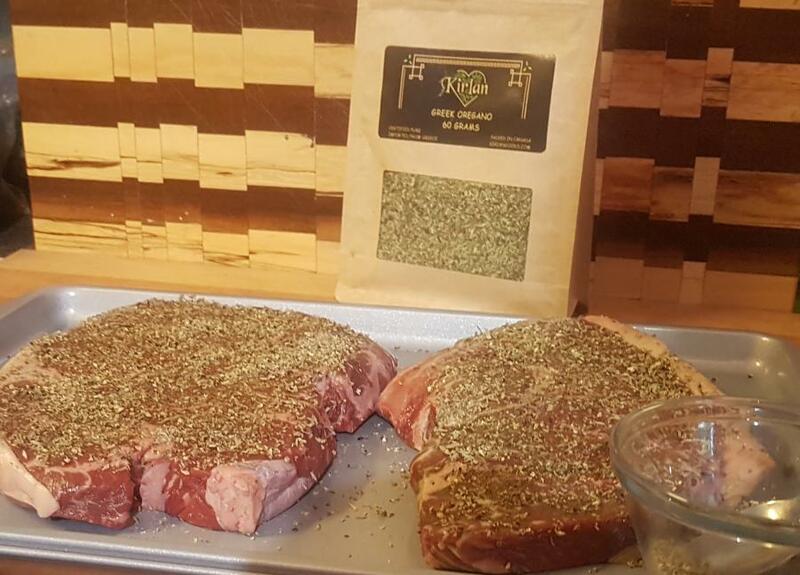 We also “rubbed” the steaks with a Greek oregano based rub before cooking. Not only does this impart an amazing flavour, there are health and safety reasons for the Greek oregano. Find out more about why you should be rubbing your meat with Greek oregano before cooking it, here.